Creating content on YouTube has been one of the most popular ways of expressing oneself in the past decade or so. The original content creators used whatever equipment they had at hand. Those early videos, although legendary by now, were rather low in quality. These days things are way different. In order to be a successful YouTuber, you will need a good camera but also a good microphone. Because of this we have put together a list of top 10 best condensers for YouTube and Vlogging. After we go over our picks we will discuss what makes these models good. Design which includes crucial accessories in a very practical way. USB connection makes it a plug and play device. Rode NT-USB is arguably one of the most complete USB condensers currently available on the market. That is quite interesting considering that his mic has been around for a while. With that said, Rode’s formula definitely still works. 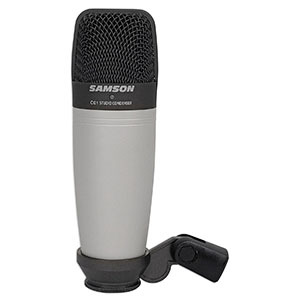 This mic brings a simple yet refined design that is known for its functionality and reliability. Its hardware aside, there’s more goodies. It appears that Rode is one of the very few brands out there who know how to do integrated accessories. 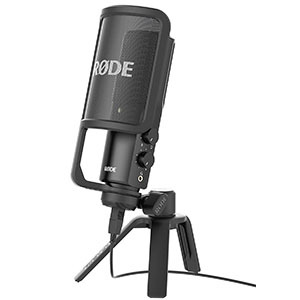 The fact that Rode NT-USB comes with a super stable tripod as well as a hard pop filter, all at this price, is quite impressive. If you are just starting your YouTube gig, this model really is a perfect choice. Compact design makes it a perfect choice for outdoors. Great sound quality coming from two condenser pods. Recording pattern designed to cover 360 degrees around the mic. Good build quality which ensures reliability and durability. One of the best cost effective solutions out there. For as long as they’ve been present on the markets, you could rely o Audio Technica to provide a cost efficient and reliable product for whatever product you need. Same applies to condenser microphones. 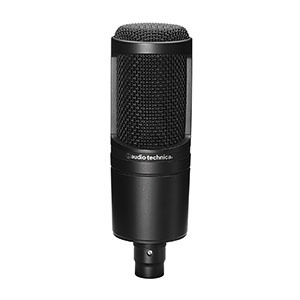 Audio Technica AT2020 has been considered to be the go to starter mic for a long time. It brings a perfect balance of price and performance. When you take a closer look, you will see that AT2020 packs a very capable condenser capsule which is great for learning the ropes on and generally getting familiar with the condenser design. All you really need is the source of phantom power which usually means an audio interface of some sort or an actual small mixer of some kind. Great performance guaranteed by a proper 1" condenser diaphragm. If you need a good bang for your buck, chances are that Behringer is going to pop up on your shortlist. That is what they are know for. 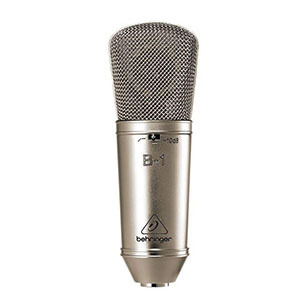 Behringer B-1 is one of the most interesting budget condensers out there which still deliver great sound quality all around. It is also a great choice if you like a vintage design. The cool thing about the Behringer B-1 is that it comes with a few features which you don’t often see among its direct competitors. We are talking attenuation pads as well as filters. The core hardware is good quality stuff that gets the job done and then some. At this price, it is really a practical solution that’s worth considering. Functional design that is easy to work with. MXL is another trusted name in the industry which you can trust. This applies no matter if you are a beginner or an intermediate user. 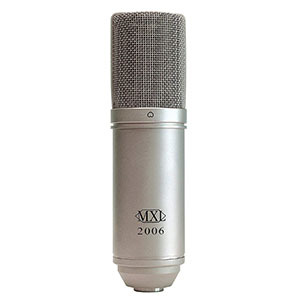 On a grand scheme of things, MXL 2006 comes in as a very solid general purpose microphone. It is quite rugged, stylish, built well and just something you can rely on for your daily work. The package itself is fairly simple. You get a microphone and a shock mount, all in a nice hard shell protective case. In other word, you will need an audio interface and a pop filter. If you are on a tight budget and want something that is a bit brighter, MXL 2006 works quite well in most cases and applications. Simple and neutral design which fits in anywhere. Wide range of applications outside of voice recording. Samson designs follow a very simple line of reasoning. It is all about function over form, although in some cases function definitely dictates form. Samson C01 is both functional and aesthetically acceptable. Samson has this habit of going for super neutral looks when they aren’t doing something specific. Since C01 is fairly standard, they followed that neutral policy all over. In terms of performance, it works quite well. The sound quality’s pretty good considering the size of the diaphragm they have packed inside there. This is still a large diaphragm unit but the diaphragm is smaller than what a lot of other LD condensers in this range come with. Aside from the mic, mount and a protective case are included. Great performance overall with plenty of headroom to play with. It is no secret that MXL 990 is one of the most popular condensers on the market. There are so many reasons for it that they would be too long to list. The ones that are important for us is MXL 990’s legendary performance, simple design and consistency. It is a great option for those who need a proven option. The package is fairly straight forward. You get the microphone, a standard screw mount, a proprietary shock mount and a proper protective hard case. 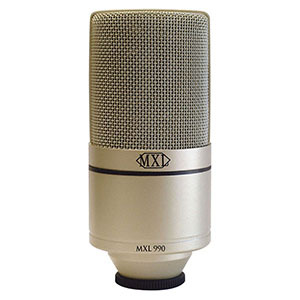 Thanks to its large fine tuned large diaphragm, you can use the MXL 990 in just about any application aside from YouTube. The mic takes a bit of getting used to but that pretty much normal. Sometimes the microphone you use isn’t only a tool but also a style statement. Especially if the mic is seen in your videos. 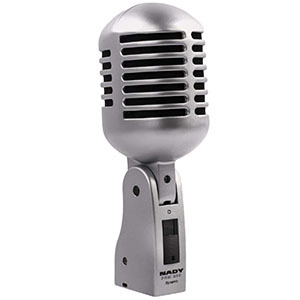 In a sea of silver pills, Nady PM-200 comes across as one of the most interesting looking condensers on the market. You’re looking at a classic design which has a lot of that vintage value to it. Looks are not all this mic has to offer. It actually packs a great set of hardware inside. The condenser capsule is a standard cardioid one, but it works quite well. The thing to keep in mind about this design is that you are limited in terms of mounting options. You are more or less stuck with a screw mount. Great aesthetics which have a strong neutral vibe. 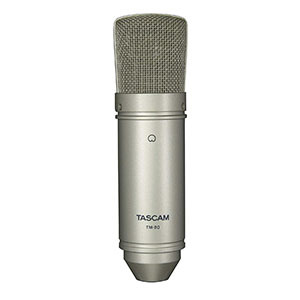 Tascam’s microphones are fairly well known for their reliable performance. Even better, that performance usually comes at a very reasonable price. Tascam TM-80 perfectly represents what this brand is all about. It’s a standard condenser package that shares the design with a number of other mics in this range. However, that wasn’t a problem for Tascam in the long run. Standing out aesthetically isn’t all that important if you have your performance covered. Tascam TM-80 definitely offers that. It is a well built package that works well with a number of different mounts, thus allowing you to set it up as you please. Overall, it’s a great starter model for anyone who is looking to get into the condenser game. Light weight and cost efficient solution. 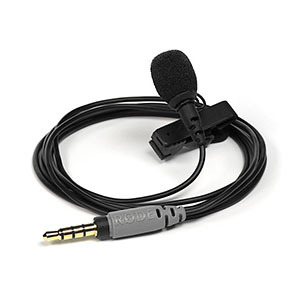 Good for recording wearer's voice but not much more. Since creating content for YouTube tends to often take place outside, using a bulky condenser isn’t always an option. If that is the case for you, something like this Rode smartLav+ might just be the perfect solution for your needs. It is a super compact mic that is easy to work with and quite formidable in terms of overall performance. Naturally it is worth noting that lavalier mics are pretty limited in the scope of uses they can address. For example, they are not something you would use to record ambient sound. 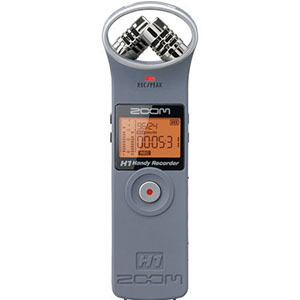 However, if all you really need is to record your own voice or that of a person you are interviewing, you should find this mic quite impressive overall. When people first get into YouTube, they are often times lost when it comes to what they should or shouldn’t do gear wise. The general idea is that all you really need is a fairly decent camera, a good idea and you are set to go. Unfortunately the reality is something completely different. If you go to YT right now and open a video from your favorite YouTubers, chances are that they have stellar video but also rock solid audio. While we usually can tell if the footage itself is good or bad, audio tends to be one of those things not everyone notices. As a matter of fact, when the audio is done right most people won’t even notice it. However, if it is not on a level where it needs to be, your entire video loses on value. So much so that some videos are borderline unwatchable simply due to the lack of appropriate audio quality. Covering your audio becomes even more important if you are not doing video heavy stuff. What we mean by this is mostly narration over animated content or something along those lines. When your only connection to your audience is your voice, it is in your best interest to make sure that it is of decent quality. A condenser microphone is simply the most logical solution when it comes to recording audio for YouTube videos. Condensers were designed to do a good job with recording human voice in all of its glory which is something they are doing best up to this day. A condenser microphone can capture the warmth human voice unlike most dynamic mics. Does that mean that you have to invest in a $500 condenser in order to have decent audio? Absolutely not, but upgrading to one down the road is definitely something worth looking into. The models we have listed above are easily among the best condensers on the market. Yet they are not expensive in most cases and offer quite a decent performance considering their price. To say that you have to have expensive gear in order to achieve acceptable audio quality is simply not true. It is much better to have an affordable condenser than none at all. What Makes A Good Condenser For YouTube? Even though the hardware and performance requirements necessary for proper YouTube audio is nowhere near as strict as requirements for music recording, some standards still do exist. There are features which you might want to look for, which is what we are going to talk about next. Before we get to that, lets discuss connectivity as it tends to be the first question most beginners have. Connectivity - USB or XLR? The fact is that both of these options have their benefits but also their drawbacks. On one hand, you have the undeniable ease of use that USB standard offers. There are no additional pieces of gear necessary and you can just plug the mic in when you need to use it. In addition to that, a USB microphone draws all of the power it needs through the USB cable, meaning that you can use it on the go. However, the fact that you are converting the analog signal into a digital one within the microphone means that the sound quality is going to suffer. How important is this to you depends on your needs and requirements. USB microphones are perfectly suitable for beginners and those who simply don’t care that much about audio quality. If however you want reach high levels of quality, an XLR setup could be a more suitable choice. Not only because there is no digital conversion within the mic itself, but also because the type of audio interface can also affect the performance of your microphone. At the end of the day a standard XLR setup gives you much more latitude when it comes to what you can do and how far you can push your gear. Some of the features which can come handy when creating YT content are mostly related to hardware. If you are on a budget, try to find a model that comes with a shock mount or at least a screw mount. Tripods and stands are not too important considering that a good number of them are borderline useless after a while. With that said, you should plan how you want to use your mic. Is it going to be sitting on your desktop or are you going to be using a boom arm? Having these pieces of information beforehand can be quite handy as some mics are optimized for one mount or the other. A proper shock mount is important because reducing vibrations is the best way to reduce noise in your recordings. Naturally, this implies that you have taken all of the other steps necessary when recording audio. Aside from hardware accessories, it is worth looking into different polar patterns. Your standard cardioid is going to work just fine in most cases although a figure 8 or a super cardioid could come handy if you are trying to capture more than one person’s voice with a single microphone. Attenuation pads are a good bonus but definitely not something you should dwell on too much. At the end of the day, a good YouTube and vlogging condenser can be described as one that offers good core performance. All of the rules for condensers apply here as well, although you don’t need to be as strict. The models on our list represent a great set of options for beginners and intermediate users. If we had to choose one model from the entire list, that Rode NT-USB takes the case. The reason for this is because it offers the best combination of performance, features and functionality for the price. With that said, all of these are great.